As long as I remember I have always been attracted to beauty and mystery, especially when it is from somewhere far away. A combination of choices and coincidences brought me to India. It is a long story. And so one fine day I came to an ancient temple on the bank of a river in the company of Kandhan, Jayakumar and Shankar, the sons of my great friend and teacher Raja Deekshithar. A quiet village, some children playing, a few people working. 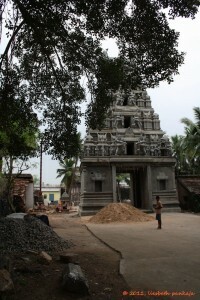 The temple was being renovated, but it was being done in a careful, non-intrusive way, as far as I could tell. Nothing of the ancient structure seemed to have been disturbed. Everything tells a story. 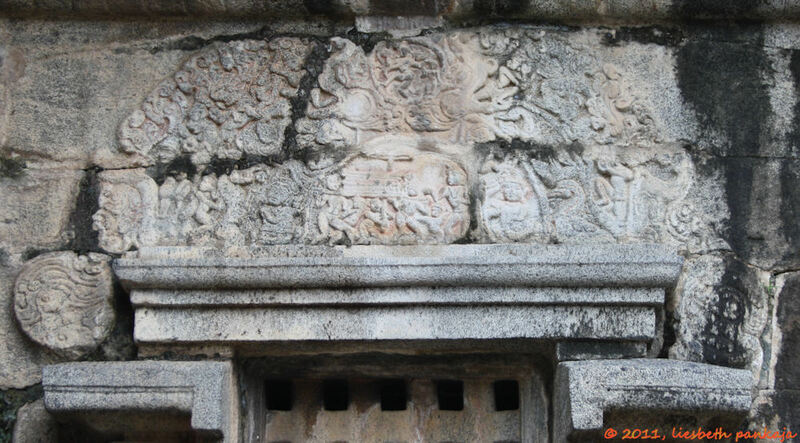 In the case of an ancient south Indian temple there are always many stories creating a kind of fabric, a weaving. There is the story of the building, the structure. What shape is it? How many talas or stories does it have? When was it build and who build it? Was it the first temple in this site or was it a renovation or reconstruction in stone? Another story is told by the sculptures. 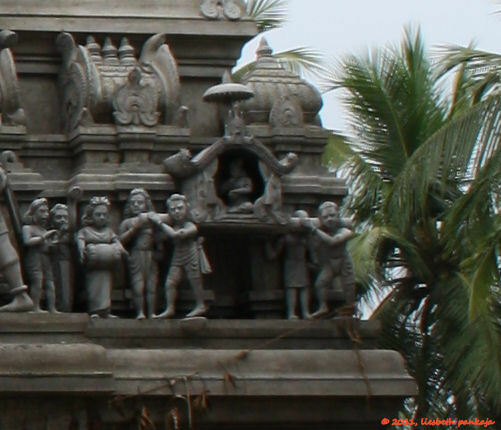 Which deities are presented in the niches? What other sculpture is decorating the temple and what is this telling us? There is the history told by inscriptions. Who donated what and for what purpose? How was the temple administered? And of course there is the story told by the sthala purana, the temple’s mythology. Through which divine intervention did this sacred place come into being? Who was the first to worship here? What are the special powers of this place? We need to understand all these stories if we are going to understand the temple as a whole. Each story is part of the puzzle that together is a sthala. A sacred place and a temple. It is situated a short distance from the Pennadam – Tittakudi road on the bank of the river Vellar. 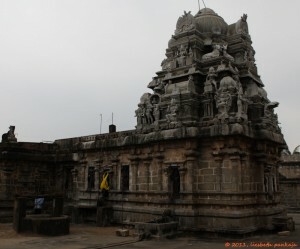 The shrine belongs to the Early Chola period. Online I could find almost nothing about it. Adisesha (the snake on whom Vishnu rests) and the Saptarishis (the seven rishis are the constellation Ursa Major) are said to have worshiped Shiva here. These two things is the only information I could find about the sthala purana. 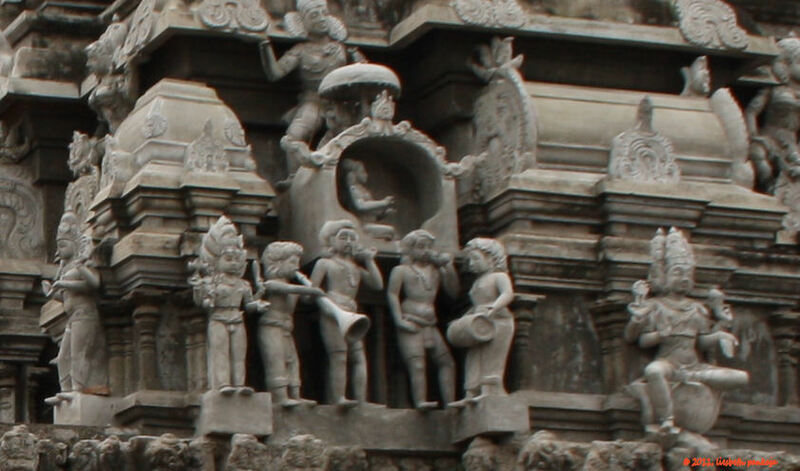 The only other story I could find about this temple is about Jnasambandar, the saint-child-poet from the 7th century. 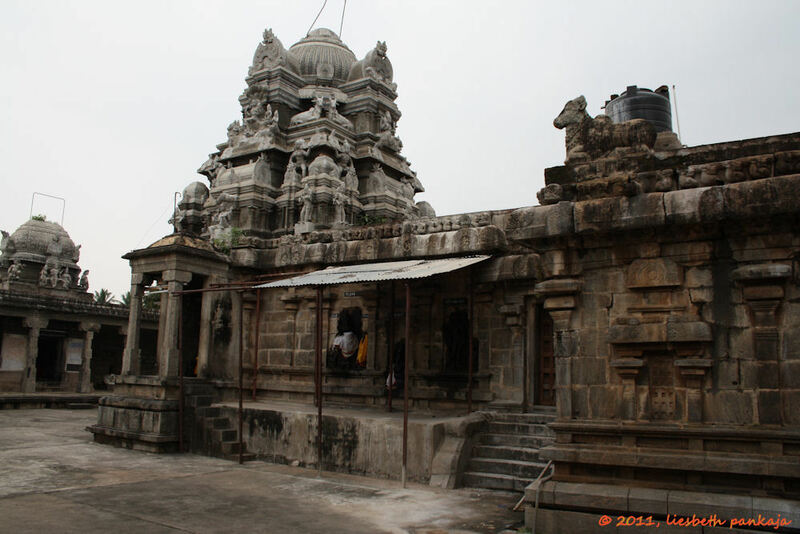 This temple enjoys fame as the place where Shiva offered a palanquin and parasol to the saint-poet Jnanasambandar. He was a small boy who traveled from temple to temple to compose and sing beautiful songs for Shiva. When he approached this temple he was very tired and Shiva gave the inhabitants of the village a dream telling them to give him a palanquin and umbrella decorated with pearls. Both are a sign of honor and distinction. Jnanasambandar composed several songs for the Shiva of this temple. This story is depicted three times. We see it for the first time as we enter through the renovated gopuram. 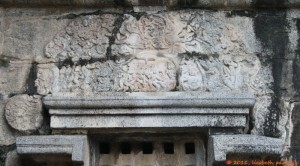 And in the central medallion of one of the makara-toranas this story is depicted as a miniature. This is without doubt the earliest depiction. We see Jnanasambandar and his father on the right side. 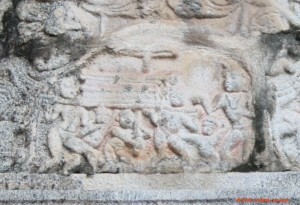 The palanquin carried by two sturdy persons is approaching from the left towards the father and son on the right. The Umbrella bearer, shown underneath the Palanquin, amazes us as he holds up the umbrella’s bamboo handle , in a manner that can be seen to this day in temple processions. The boy and his father express happiness and a sense of gratitude for the blessing offered by the Lord through the people Arattathurai. The Jnanasambandar raises his arms and his father gestures his thanks and maybe also surprise with arms stretched out, palms up. Above this scene Shiva dances His Ananda Tandava together with Sivakami, blessing the whole scene as it were. The sculptor catches the emotions in this small panel brilliantly. After a thousand years we still experience the happiness and gratitude of the little boy and his father for this offer of transport and honor for the tired little poet. The palanquin is of a different design then what we are used to today. It is rectangular and flat with the umbrella offering protection from the sun. The other two depictions of this legend show the saint poet sitting in the palanquin and being carried and received with music. Here the palanquin is depicted as we know it today, with a curved roof protecting the passenger from the sun and rain. 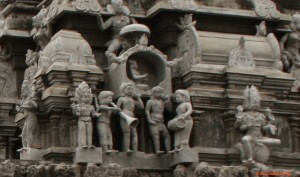 The umbrella is depicted as fixed on top of this roof, where it looses its function of giving shade and pr otection from the rain. It is not possible to tell whether these narrative panels were added recently or not. But it is interesting to see the differences between the two narratives. One is as old as a thousand years. The other must be of more recent times. Both show the love and respect for the traditions of this village. I have only one possible regret. The renovations of the gopuram and vimana seem to have been made with a kind of cement and not with the traditional stucco or lime work. I hope I am wrong. Traditional materials last much longer.